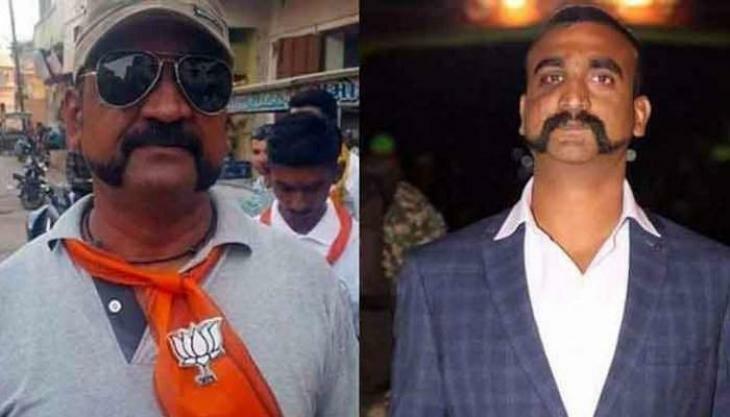 NEW DELHI (UrduPoint / Pakistan Point News / Online - 17th April, 2019) An image of a doppelganger of Indian Air Force (IAF) pilot Abhinandan Varthanam, who was captured and later released by Pakistan, has gone viral showing him openly support the Bharatiya Janata Party (BJP).The post which has gone viral on social media claims that IAF wing commander supports Indian Prime Minister Narendra Modi's BJP and voted for the party in the ongoing election in the country.The post has a photograph of a person who resembles Abhinandan , has the same handlebar moustache as him and is sporting a saffron scarf with the BJP symbol imprinted on it. The caption urges people to vote for the BJP. However, several Indian papers reported that the man in the picture was not Abhinandan but his doppelganger and that any claim which asserts that a serving officer of the IAF is actively campaigning for a political party is false. "Under the Air Force Rules, 1969, IAF personnel are not permitted to take part in political activities," stated reports.The Indian papers also compared Abhinandan's picture with that of the man in the viral post and pointed out differences.Abhinandan was captured when his fighter jet was shot down by the Pakistan Air Force on February 27. The IAF pilot was later released by Pakistan as a gesture of peace.